We get asked a lot of questions, which is great. However, below you can find the most frequently asked questions, either on the FAST™ solution itself, technical aspects, support, services-related queries, or how the solution is licensed. Talon FAST™, File Acceleration and Storage-Caching Technology, is a software based solution that creates software-defined storage fabric, extending your on-premise or cloud datacenter storage to your distributed branch offices. Talon FAST™ helps customers centralize their unstructured data, consolidate branch office storage and infrastructure, eliminate branch office backups, increase productivity, and enable global collaboration with distributed file-locking, all while guaranteeing a high performance experience for your end users. What problems does FAST™ address? FAST™ solves the challenges associated with distributed storage, including the challenges of managing "Islands of data" in branch office environments, data proliferation, local backups, exponential data growth and, key business productivity issues such as incomplete data management, duplicate file versions, and data corruption or loss. How does FAST™ solve these problems? FAST™ allows centralized data to be accessed by branch office users in real-time, while maintaining optimal performance. The technology leverages Intelligent File Caching technology to cache the active data sets, keeping the most relevant data local to the users. Additionally, the software leverages compression, streaming, and delta differencing to move the data (increments) between branch office and datacenter. What kind of customers or business verticals utilize FAST™? The solution works in any vertical that uses unstructured data or file shares. The largest Global 2000 customers, including companies like ARUP, Burns & McDonnell, Capita (UK), Implenia Group, Syntheos Health, LEGO, Sweco, Swiss Re, Vistaprint, and WSP Group leverage our software. From traditional Microsoft Office applications to the most complex large AutoCAD, Civil3D, Revit BIM models, and image libraries, our software can handle it. How does the FAST™ solution fit into my environment? The software is transparent and storage agnostic and integrates in any data-center environment, leveraging your existing backend storage infrastructure, i.e. NetApp, Dell/EMC, or other on-premise, hybrid, or public cloud environment. An SMB/CIFS or iSCSI backend storage interface is required, after which the data center storage is seemlessely extended to all the remote sites in your organization. How do I eliminate branch office backups? By centralizing and consolidating your distributed branch office unstructured data, i.e. 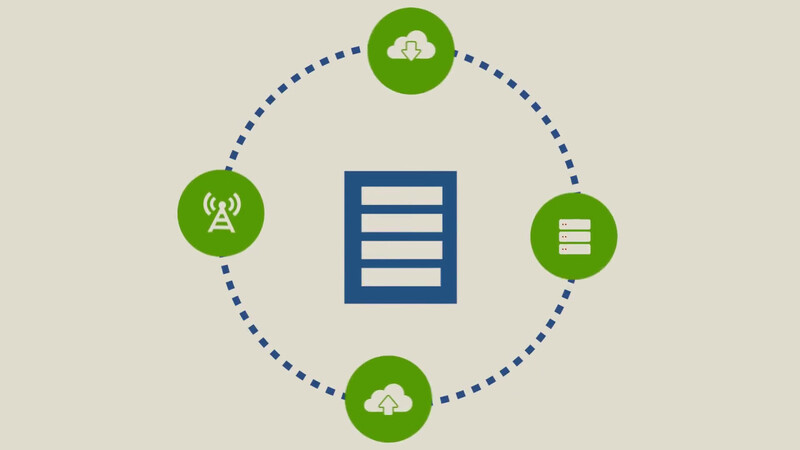 file servers, NAS or other storage devices, to a central location, you will manage your backups in one central place. FAST™ software merely provides a cache at each location, which does not host or store any authoritative data, only what's cached at that branch. If you were to lose your cache instances, all your data is centrally stored and protected. Do I need to back up my FAST™ instances? No, each FAST™ instance only contains a cache, which eliminates the risk of data loss in branch office locations. How long does FAST™ software take to deploy? What do I need to deploy the software solution? Talon FAST™ software deploys on commodity hardware or on top of a Windows Server 2012 R2 or Windows Server 2016 instance, using either a physical or virtual server instance. Where do I deploy the software? Talon FAST™ core instance is deployed in your (cloud) datacenter where the authoritative data resides, i.e. your backend storage infrastructure. Additionally, each branch office requires a FAST™ edge instance containing the Intelligent File Cache, which can be deployed on a virtual or physical Windows Server instance. Note: the first (core) instance is typically deployed as a License Management Server, which activates your site-based subscription with the Talon subscription service. More about the License Management Service (LMS) can be found in the Pricing & Licensing FAQ or Talon FAST™ user guide available in our download portal. What are the hardware and software requirements of the solution? Talon recommends 4 (v)CPU cores and 16GB of RAM are for any FAST™ instance, either FAST™ Core or Edge, along with NTFS volume capacity for the D:\ volume hosting the Intelligent File Cache (edge only). The software is deployed using a standalone executable, readily available .OVA or .VHD templates, or even using scripting/automation through PowerShell Desired State Configuration and Azure Automation. How do my users access their central data? The software creates a Virtual File Share (\\Edge\FASTdata) at each branch office location which looks and feels like a traditional file share. This file share presents centrally provisioned file shares in real-time, while data is centrally stored on one or multiple file servers at the datacenter. This share can also be accessed a DFS link target within a domain or standalone DFS root. How does the Intelligent File Cache work? Each FAST™ edge instance contains a unique Intelligent File Cache, hosted on the cache volume (D:\). This cache resides on an NTFS file system and only caches the active data sets, files, and folders, but also meta data and NTFS permissions, etc. Once a user opens a file through the FAST™ virtual file share, i.e. \\Edge\FASTData\DC\FS1\Share\Folder\Doc1.docx, the file will be centrally locked on the users behalf, streamed, and compressed over the WAN, and stored in the edge's Intelligent File Cache, maintaining the original folder structures, meta data, and NTFS permissions. Any subsequent edits will be delta differenced back to the datacenter authoritative source, i.e. \\FS1\Share\Folder\Doc1.docx. How do I size the Intelligent File Cache for my branch office? As each cache is unique, and requirements may vary per site, the sizing of the cache is important. You may have 500TB of central storage, but for a small site you may only need 500GB or up to a TB worth of cache space to facilitate the active data set for your users in that site. For large sites, with up to 250 users, best practices dictate that you provision your cache volume to be at least twice the size of your active dataset, i.e. when your active dataset is 1.5TB, provision 3TB of storage for the cache volume. How do I determine my active data set? Many customers are challenged understanding the actual data footprint. In order to identify the active data set for your environment, we can leverage tools such as TreeSize pro to understand what the active data set looks like. Typically, our clients provision no more than 1TB of storage in a small office (< 25 users), and up to 5TB of cache in the largest offices. Are there any limitations on the size of the cache? Our software adheres to the limitations of the underlying storage subsystem and file system, being NTFS, which means you can have cache volumes as large as 16TB using the standard NTFS 4KB cluster size, and cache sizes up to 256TB using the maximum 64KB cluster size. How does the Intelligent File Cache stay current and up-to-date with my active data? Unlike other solutions, the FAST™ software does not actively replicate (meta) data between branch offices, meaning each cache is unique and only contains relevant data. In order to pre-seed active projects or folders in specific branch offices, you can leverage pre-population. Pre-population allows you to update all the files for a specific project that have been modified in the last X days, which enables your users to collaborate effectively on a global scale as data sets stay current. How does the Intelligent File Cache clean up stale data? As data gets cached on your FAST™ edge instance, either by accessing files on-demand or using pre-population to pre-stage certain shares, folders, or files, the cache volume will gradually grow in terms of storage utilization. Once the cache volume hits 80% of the cache utilized, it will schedule a purging job to be executed at 9PM local time (or a time of your choosing) that day. The purging process will clear out the cache using the Least Recently Used (LRU) algorithm by categorizing data into buckets, i.e. older than 2yrs, 1yr, 6 months etc., and clean out the stale data from the cache, freeing up space for new active file sets to be cached. How do I migrate a server from my existing branch office to a FAST™ edge instance? There are multiple ways to approach this. We would typically provision a Talon FAST™ instance in parallel to your existing file server, followed by moving the branch office data to the datacenter, using either on-line or offline data migration tools (i.e. robocopy data directly to the datacenter or into the FAST™ virtual file share). We will discuss the right approach for you, depending on the size of your dataset and infrastructure available to facilitate the data migration to the (cloud) datacenter. In some cases, it is beneficial to pre-seed the cache with the active, raw data set, which allows you to pre-provision the cache with the most recent project files while moving all data to the central location. How does Talon's distributed file locking mechanism work? When a user opens a file from the FAST™ edge instance, the edge communicates with the core to obtain a lock on the file stored on the central file server. Once the core locks a file on the user’s behalf, a “lease” for that file is established between FAST™ edge and core, and subsequently a lock can be granted to the end user on the edge. Locking information is kept centrally on the authoritative file server, so no locking information is replicated to other branch offices, unlike other solutions, which allow scaling out to an unlimited amount of offices. The locking mechanism is fully centralized, which means that locks will be maintained consistently on the backend storage platform and the backend storage platform can be directly accessed in parallel with accesses through the Talon solution. How secure is Talon FAST™? Talon FAST™ leverages SSL encryption communication between the Core and the Edge, and can be further secured utilizing the existing MPLS or VPN connectivity within the customer environment. Data is secured using Microsoft ACLs for NTFS permissions and access controls at the datacenter, which are seamlessly extended to the distributed branch offices. Additionally, files within the branch office Intelligent File Cache can be encrypted using technologies such as BitLocker. How does Talon achieve its optimal performance? The software uses a wide variety of technologies to keep the active data set close to the users in each of your distributed branch offices by leveraging the Intelligent File Cache, which caches data either on-demand or through pre-population. Additionally, the software overlays the SMB protocol within a Windows environment by providing a local Virtual File Share in each branch office. This directly interacts with the NTFS volume of the Intelligent File Cache and leverages mechanisms such as compression, streaming, and delta differencing to efficiently move data between the branch office and the central datacenter or cloud. How does Talon work in a high latency/low bandwidth environment? In the Talon solution, files remain persistently cached at the branch office instances, which eliminates most of the movement of data over the WAN, thus saving bandwidth. In addition, with the Talon solution, only the changes to a cached file are sent back to the datacenter, so that even changes to very large files can be moved efficiently. Talon's delta differencing mechanism means that incremental updates are occurring, drastically limiting the total amount of data going over the WAN. This provides high efficiency in impacted network locations, allowing the users optimal performance. What happens if a FAST™ core or edge instance goes offline? In case of the core instance being unreachable, users can still access and work on their locally cached data—they're not stuck waiting for recovery, whether that's network or a server rollback. If the edge instance is unavailable, users can still go directly over the network back to the datacenter to access the centralized dataset directly. In addition, note that failback can be automated via DFS. How is security of files handled? Since our solution sits transparently on top of the Microsoft operating system, all existing ACL's, permissions, AD based authentication, and any environmental controls are passed on from the central data center to all branch offices. This means there is no additional security settings to administer, creating an easy to manage and scale workload. How is management and reporting handled? Talon FAST™ provides administrators custom Event Logs on all system messages and file operations. This can be further streamlined with the available SCOM Management Pack and Dashboard, which gives administrators Single-Pane-of-Glass insight and reporting on the overall health of the Talon FAST™ environment, servers, services, cache utilization, etc. How does Talon handle file snapshots or Previous Versions? Previous Versions are managed at the datacenter on the authoritative copy of the data. However, Talon FAST™ gives users at the distributed locations the ability to transparently navigate through the Virtual File Share and restore a previous version as needed. How can Talon FAST™ help with our cloud initiative? Talon can provide a seamless transition of unstructured data to the cloud as the solution is storage agnostic, which means we can work with any SMB/CIFS, DAS, or iSCSI backend storage platform. Whether you are mounting directly to a Windows Server or to NetApp ONTAP Cloud in Microsoft Azure, the software fits your strategy. Files that are centrally stored in your (hybrid) cloud datacenter are cached locally at the edge, benefiting from distributed file locking, streaming, compression, and delta differencing. How do I contact Talon Support? Talon Support can be reached via phone and email. For more information consult the support page or contact our support team at support@talonstorage.com or call us at +1.877.280.4802 (option 2). What level of support can be expected from Talon? Talon has support centers in the US where it is headquartered, EU, and AUS. We are staffed 24/7, and will always speak to a person when calling in with a technical issue. Support has an exceptional track record with our existing customers, with a 95+% satisfaction rate. We also have a customer facing portal that provides solutions to common issues and best practices. How does Talon handle customer deployments? Talon Professional Services are engaged with every deployment, with a customized plan that includes: site survey, evaluation deployment, Core and Edge deployment to test, and production environment, as well as setting up the frame work to seamlessly scale out as your data needs grow. In addition, Talon provides remote professionals services for installs and health checks. How is Talon FAST™ licensed? Talon is licensed as a site-based annual subscription. This is typically counted as the number of distributed branch instances of the FAST™ software, typically one per branch office. There is no charge for FAST™ core instances, customers can deploy as many FAST™ core datacenter instances as needed. How much does Talon FAST™ cost? The cost is dependent on the number of sites identified as distributed branch offices. This annual fee includes the software, maintenance, and phone/web support. Does the cost increase when I add new offices or data centers? The cost will only increase if the total number of branch office Edge instances increases and is independent of the data center infrastructure or the number of data centers. This allows for flexibility in a changing organization as datacenters evolve and the need for Talon FAST™ shifts across offices. The software includes Talon's License Management Server (LMS) which registers your site-based subscription with the Talon subscription service. The LMS instance is subsequently keeping track of all licenses given out to all FAST™ instances in your enterprise and regularly updates your subscription details with the Talon subscription service, i.e. contract end date or amount of sites licensed for. Do I need to license all my Talon FAST™ instances? Licenses ONLY apply to FAST™ edge instances (site-based). FAST™ core instances must be registered with LMS, but are available free of charge, meaning the license granted to the core will not be counted against your subscription. Is the licensing considered a Capital Expenditure, or Operational? Talon FAST™ licensing is an annual subscription, so it can be considered an Operational Expense. We do offer multi-year subscriptions. How is Talon FAST™ different from other competing solutions in the marketplace? Talon FAST™, with its storage agnostic software-based approach, accommodates physical or virtual deployments, On-Premise and/or Cloud Datacenters, and scales across limitless branch office locations and user counts. How does Talon FAST™ affect my branch office storage strategy? Do I still need backups? Typically, more than 80% of the total data sets are considered "archived" and inactive. The Talon FAST™ solution allows for consolidation of data and integration into private or public clouds to reduce data center infrastructure complexity, maximize data protection, reduce overall storage total cost of ownership (TCO) by 60-80%, and provision storage more rapidly. With your data centralized into an authoritative single set in your datacenter, Talon FAST™ allows you to collapse extensive and expensive storage, along with backups, to see immediate savings. Not only are you able to eliminate backups and reduce the overall server and storage footprint across all of your distributed locations, but also you will save money and manhours not having to manage it all. Does Talon FAST™ control my data? No, Talon FAST™ does not control or manage your data—ou will always have complete control of what your data resides on, where it resides, and how it's backed up, archived, and secured to meet your organizations specific needs for RTO/RPOs, SLAs, BCDR strategies, etc. How does Talon FAST™'s file locking work compared to other solutions? Aren't they all the same? Not quite. With Talon FAST™ and its distributed file locking mechanism, all users across all sites ensure and maintain data consistency and integrity. When any user accesses the central authoritative copy of the file directly or through a branch office’s Virtual File Share, a file lock is placed immediately on the central copy. Any other user accessing the file will receive notification that the file is locked and in use. Talon FAST™ doesn’t replicate locking information across all sites, or rely on maintaining lock synchronization databases—file locks are immediate and central to all users. Further note that users can bypass the solution to directly access the backend storage, all while maintaining correct locking and consistency across Talon enabled and non-Talon users.